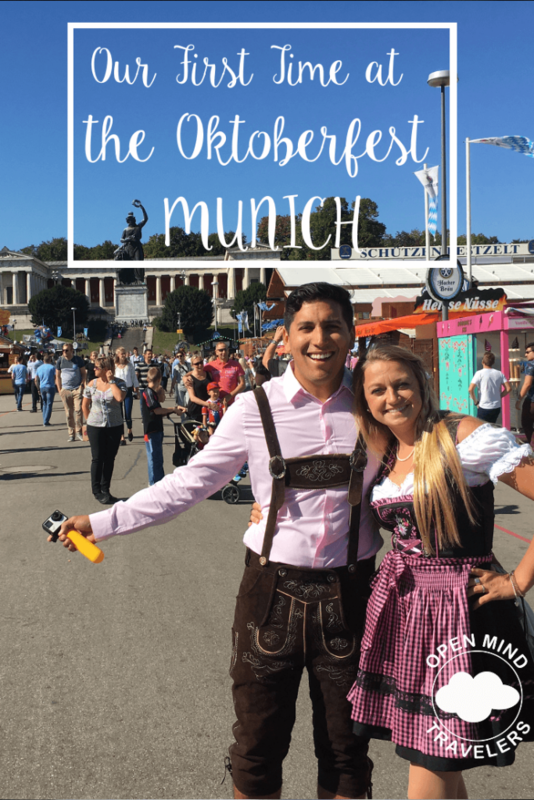 As a german girl from bavaria, it is almost a shame to tell you, that I have never been to the Oktoberfest in Munich! So this year we thought we need to change that fact! 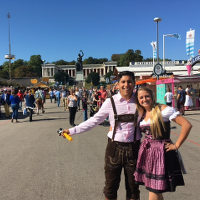 Jeremy and I borrowed the typical bavarian style clothes from our friends – a dirndl for me and leatherpants for Jeremy and took of to Munich! We traveled to Munich by train. Because we live in Würzburg in Bavaria, it is really cheap to travel by train within Bavaria. The Bavaria ticket was 28 Euro for us 2 and we could travel from 9 am to 3am the next morning everywhere in our state, even with the local buses. Jeremy and me stayed at the beautiful Angelo by Vienna House Munich (blog post coming up soon), which is in the perfect location in the heart of the city. 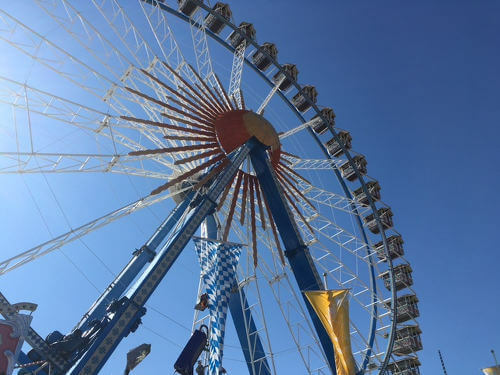 On Thursday at 11 am, after our great bavarian veal sausage breakfast in our Hotel, we went to the Oktoberfest and were really impressed. Normally I really don’t like the loud and crazy beertent atmosphere, but it was not as much packed as we expected. 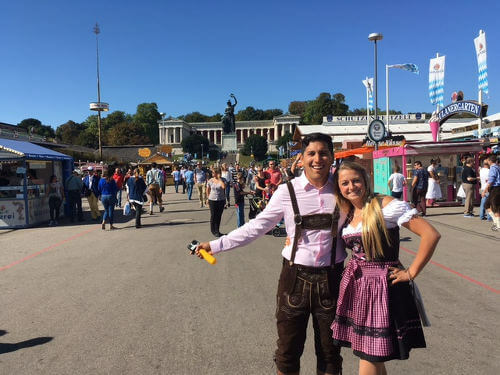 This is us in traditional german costumes in front of the famous statue called Bavaria. As you can see, it was a perfect and sunny day with not too many people! We were really lucky! After walking around for a while, we jumped in the ferries wheel, where we could overlook the whole square. 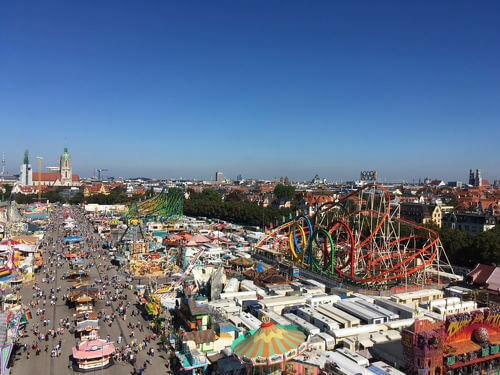 This was an amazing ride, but with 7,50 Euro a little pricy compared to other german fairs. 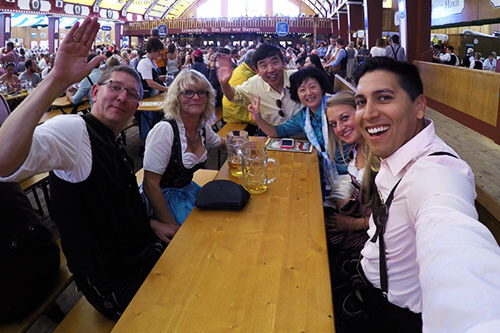 After a couple hours at the Oktoberfest we walked into the first tent and it was quite funny. The atmosphere was really good, everybody was happy and the music was awesome! We picked the Löwenbräu tent to sit down, drink a Maß Bier (1 liter Beer) and ate a roast chicken. The prices are really high, but the people pay it. One liter of beer is 10,60 Euro and our roast chicken with a bun was 12,20 Euro, but super delicious! We met really good people from all around the world and clinked glasses together and had nice conversations! 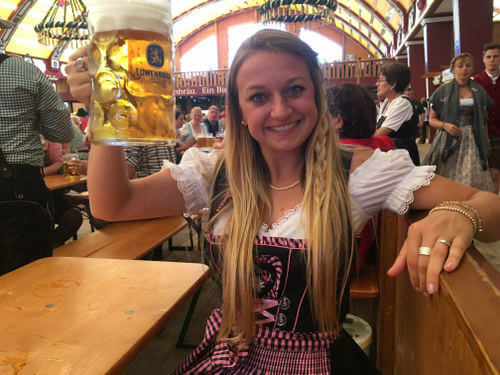 When you visit the Oktoberfest in Germany the roast chicken, roast pork, the obazda (traditional german homemade cheese) and in the mornings (before noon) the bavarian veal sausages are the best things to eat! All of these are very traditional and super delicious! You can not go wrong with that. We can highly recommend the angelo by Vienna House Munich Westpark, which is in the perfect spot and a great hotel for city traveler. We love the modern design combined with the german hospitalty.